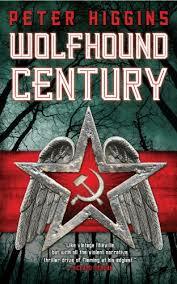 Wolfhound Century, Peter Higgins's fantastic debut, defies easy classification. Two parts detective fiction, one part dark fantasy, one part political thriller, one part dystopian fiction, and one part fairy tale, it sits in the sweet spot between the variety of genres we cover here at Nerds of a Feather. And there it sparkles, at times with searing, polished brilliance, and at other times with the rough potential of an uncut gem. This fantasy centers on protagonist Vissarion Lom, a police investigator in the provincial town of Podchornok. One day, Lom finds himself summoned to the capital, Mirgorod, to investigate terrorist acts connected to known anarchist Josef Kantor. The summons for Lom, a newcomer with no network or allegiances in the capital, constitutes a long-shot. Lom's employer, Under Secretary Krogh of the Ministry of Vlast Security, hopes that Lom will have reasonable success in convicting Kantor without drawing the attention or ire of the Vlast's secret police (who may in fact be protecting Kantor). And the stakes of this investigation could not be higher. Kantor is the lynchpin that connects with darker, more insidious problems within the Vlast. Despite propaganda to the contrary, the Vlast is weakening, as its war against the Archipelago is not going well. Making matters worse, an angel has crashed into the forest outside Mirgorod, and is heaven-bent on escaping its forest-prison by any means necessary. And fearing the power of the angel, the forest sends to a spirit-emissary upon which one of humanity's possible futures may depend. The true wonder of this book is in the dark yet beautiful setting. Wolfhound Century blends Russian history, mysticism, and the tensions of industrial life in a totalitarian state. It is set in an alternate reality, a mystical world in which golem-like mudjhiks, giants, great wolves and elk, and sentient rain exist alongside trains, guns, explosives, and other implements of modern life. This is an alternate Russian reality. Mirgorod is perhaps St. Petersburg, constructed on a swamp at the mouth of the Mir (the Neva River, no?). The Vlast is an ossified Stalinist regime that overflows with paranoia; hence it both controls the populace through incessant propaganda and lashes out in gratuitous violence and murder. And the Vlast finds itself confronted with equally violent revolutionaries who preach the ideology of permanent revolution. The story thus takes place in a Russian dystopia, a totalitarian state fighting a losing war abroad while fearing revolutionary intent from within. Wolfhound Century is divided into two parts. Part 1 is forehead-slappingly brilliant. Genius, even. Higgins presents the reader with a number of slowly unfolding mysteries. Why is Vissarion Lom called out to Mirgorod, an area in which he has few connections? What is the slab of angel skin doing on his forehead? Who is Josef Kantor, and what are his aims? And how do they relate to stories of a fallen angel outside Mirgorod? Higgins slowly unravels these mysteries with a beautiful prose that at times borders on poetry. And gradually, the reader becomes aware of a broader plot that is no less compelling than the world Higgins has created. It is the complex characters that propel the story forward. Strikingly, both protagonist and antagonist alike appear preoccupied with different notions of order. Vissarion Lom is a decent cop with a difficult past. He thus cuts a familiar figure as a high-idealed protagonist who serves the broader social order. Raised in a state institution, he joined the police (becoming an inspector) as a matter of course, despite the fact that his morals are too finely honed for the rampant corruption of the state he supports. Lom's sense of propriety is so strong that he arrested and convicted his own boss for corruption and murder. He is, in short, out of place. Too moraled for his immoral, rotten, corrupt, diseased world, and tired of harassing residents instead of tackling corruption. It is only the job in Mirgorod that saves him from his enemies in the police and the certainty of life in a (Soviet) gulag. Will the very principles that make him the perfect totalitarian soldier (the perfect upholder of the social order) cause him to rebel against the corrupt state that raised him? Josef Kantor, the antagonist, is a charming figure that makes no qualms about his desire to wreak havoc throughout the Vlast. But while Kantor is sworn to revolution, to overturning the existing social order (albeit to create a new one dominated by him), he is at the same time obsessed with personal order, the code by which he lives. Although he is fights for a new future, Kantor at times seems even more obsessed with his personal code. Kantor's life had been shaped by the dialectic of fear and killing: If you feared something, you studied it, learned all you could from it, and then you killed it. And when you encountered a stronger thing to fear, you did it again. And again. And so you grew stronger, until the fear you caused was greater than the fear you felt. Abandoning this code, which he did only once in the past, may ultimately prove to be his undoing. Wolfhound Century should not be read as a traditional epic fantasy or as a moralistic tale that pits unlikely heroes against the seemingly dominant forces of evil. Instead, Higgins presents Mirgorod as a contention zone, a battle between two sides that are fighting for their share in the emerging order. Victory by either side will represent a different path for the future: a harder, more authoritarian future that perhaps leads to different worlds; or a softer future, no doubt one in which humanity lives in greater harmony with nature. It is truly unfortunate, however, that Part 2 jettisons the brilliance of Part 1. The mystery shifts into an unresolved adventure story that not only fails to do the novel justice, but also ends abruptly. I had expected some type of resolution. Instead, the book ends without much happening. In this sense, it should be read as the first installment of a broader series. But this detracts in a major way from the overall story. I believe Higgins would have benefited either from publishing the novel as a fleshed out version Part 1, or from adding quite a bit more to the ensuing adventure story. As it stands, it ends on an unsatisfactory note. This does not detract from Higgins's achievements. His compelling world and interesting plot have made a fan out of me. Fans of dystopian fiction, noir, and science fiction and fantasy (especially those weary of tired old world building that always seems to center on English history or Western European norms) will find much of interest in this book. I, for one, can't wait to see what happens next. Bonuses: +1 for angels, angel skin, and the sentient golem-like beasts, the mudjhik; +1 for sentient rain and other strange, fantastic entities. Penalties: -1 for the Pollandore, which is not that interesting, -2 for Part 2 and an ending that wasn't an ending.